Within days of taking power, the Nazis called for Germany to boycott all Jewish businesses. This surprised many people as they had not expected the Nazis to act of their anti-Jewish ideas. This is the start of years of anti-Jewish propaganda. Nazi propaganda minister Joseph Goebbels arranged for a boycott of Jewish-owned businesses. He would later explain in an April 1st speech at the Berlin Lustgarten that the boycott was in retaliation for anti-German “atrocity propaganda” spread by the “international Jewry” in foreign newspapers. SA storm troopers were ordered to stand in front of Jewish shops, department stores and offices to intimidate customers. Large stars of David were painted on storefronts and propaganda signs were displayed, such as one pronouncing: “Germans, defend yourselves against Jewish atrocity propaganda—buy only at German shops!”. 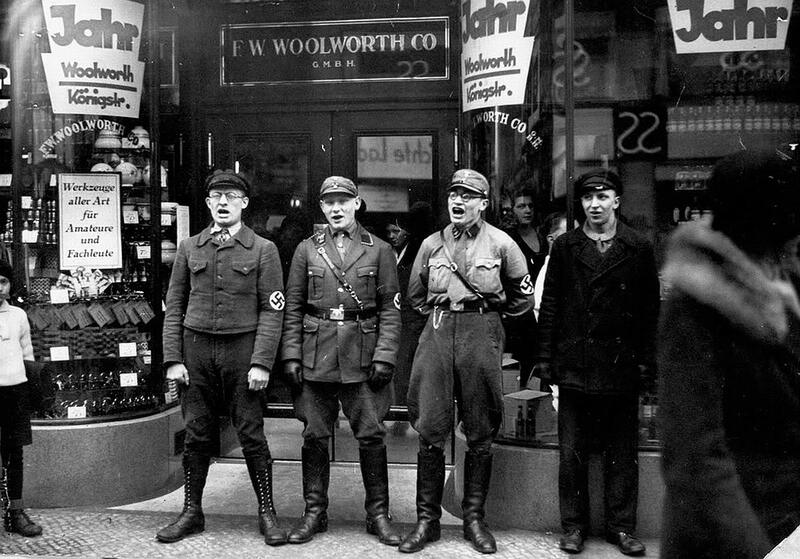 The shop in the photo was owned by Woolworth, the company later fired all Jewish employees and got the “Adefa Zeichen”, a seal for companies who were “pure Aryan”. The guy on the right doesn't want to be there! How can you tell ? He is not singing as loud as the others or his uniform is different ? Here's an interesting fact. The Nazi's were simply responding to what the International Jewish Community had already done 3 times to the Germans. Publicly declare war on them. Why don't you mention that. Facts are facts. Yeah, Zionist Jews declared war on Germany in 1933, funny you never hear about that in the main steam press, isn't it? Hitler always claimed that he wanted to exterminate the Jews. They just fought back.